The search for 'big tube amp tone' in a manageable package has gone on for many years. There have been scores of devices made that claimed to be a stack-in-a-box. Some devices were pretty close, others were just hype. Needless to say, the search goes on. For many, the holy grail is the venerable Marshall stack sound. It wasn't too many years ago that the Marshall amp was the only amp that could rock so very hard and not mush out on the bass notes. In those times (and many today) the Marshall sound is the 'Sound of Rock.' The mighty Super Lead models were the amps most guitarist in the '80s craved, mostly due to a Dutch-born kid in living in California. Much study has gone into the Van Halen sound. Most accounts of his setup describe a stock Marshall Super Lead running wide-open into a load box. The load box is used to attenuate the massive power of the 100W head. With this load box in place, he was said to have run the amp with all knobs full up to get an awesome sound. On down the signal chain, a speaker emulation device was said to have been used. After that, came reverb and echo and maybe a few other effects. Doug Hammond has done incredible work recently using JFETs to simulate highly desired tube amps. Doug's 'Meteor' stompbox has incredible gain and sounds very much like the Trainwreck amp it is modeled after. After studying Doug's work, we decided to try the same technique with the Marshall Super Lead. The goal was to achieve the wide-open Marshall sound. We chose to omit the tone stack and the associated buffer stage from the Marshall Super Lead schematic for two reasons. First, we wanted the 'all knobs on 10' sound, which makes the tone stack virtually bypassed. Secondly, it makes the build simpler. We named the project Thunderchief. While Thunderchief does not sound exactly like the famed VH setup, it shares some qualities. There is good focus in the bass frequencies. There is tons of gain. The highs are sharp and clear, but not piercing. Lead playing is effortless. Controllable feedback is there. Touch sensitivity is incredible. It does not mask the sound of a guitar, despite the incredible gain. Add the buffer and tone stack back in for more flexibility. The buffer and tone stack would go between the second and third JFETs. 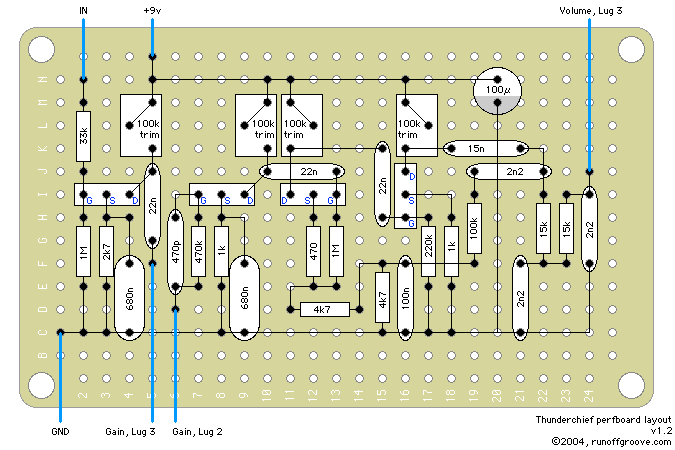 Look at the Super Lead schematic at schematicheaven.com for details. Add a pot between the power supply and the drain resistors of the JFETs. Call it a 'VARIAC.' You'll notice a mushier feel when you take the voltage down to 2V or so on the drains. Make the first bypass cap (0.68) switchable. Use an SPDT switch to change from 0.68 to 10uF. This allows you to switch between the amp's 'normal' and 'lead' channels. Yes, the original amp used a 250uF cap here and that's what we originally suggested. However, there may be some magic when dealing with a tube rather than a FET and Jim Marshall may have had other reasons, but here's what the math says: The stock configuration of 2k7 and 680n sets the corner frequency at 87Hz, which is slightly higher than the open low E string. When using a 10uF cap, the corner moves to 5.9Hz. All audible (and inaudible) sub-harmonics are present. If the cap is increased to 220uF, the corner is reduced to .3Hz. So, there's really no need to go larger than 10uF. Try using different JFETs. J201s provide more gain than the actual amp had. It sounds great, but may be too hot for some. Try lower powered JFETs for a milder, more classic sound. Adjust the value of the final coupling cap to add or subtract more lows. Small changes in value can make big differences in sound. Below are the transistor pin voltages from the official runoffgroove.com build. Fixed resistors were used to approximate the trimpot value, resulting in slightly lower than 4.5V at the drain of each FET. Pablo De Luca kindly contributed a PCB layout (PDF, 154k) for Thunderchief. Thunderchief by runoffgroove.com is licensed under a Creative Commons Attribution-NonCommercial-ShareAlike 3.0 Unported License.